Drummin Ogham Stone, Stone Pair. I decided to visit the ogham stone here at Drummin since I was in the vicinity. It turned out to be one of the most intriguing sites I have visited lately. There is what appears to be a stone pair standing within the SW perimeter of a large ringfort. 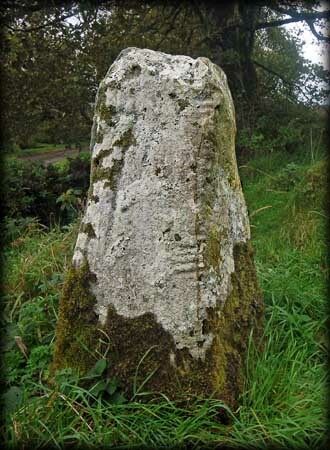 One of the stones appears to have been white washed, a practice that is not uncommon throughout Ireland. The white washed ogham stone, shown left, measures 1.05m H x 0.45m W x 0.5m thick. Owing to damage to the stone the inscription has proved to be quite difficult to read - some suggestions are CUNAVATO or CUVEATA. 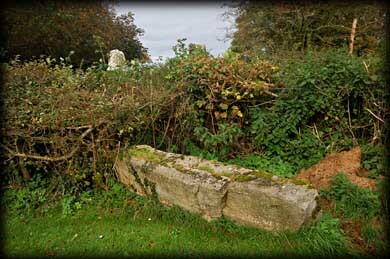 The second stone of the pair is 1.5 metres south of the ogham stone. It too measures 1.05m in height by 0.6m wide and only 0.25m thick. 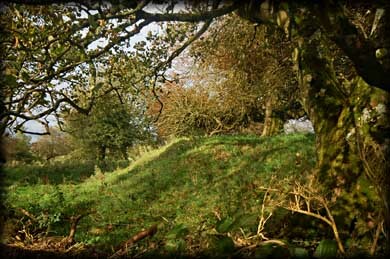 The ringfort is about 55 metres in diameter and has a deep fosse and outer bank. The outer bank at the SW now forms a field wall. Immediately below the stones outside the field wall is a third possible standing stone lying prostrate. It is thought to have fallen from the bank. I wondered whether it was part of the entrance, forming a step in the bank leading into the ringfort, similar to the large stones at the monastic enclosure surrounding St Mella's Cell. 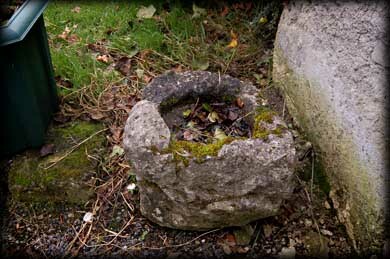 The landowner led me to another stone he found in one of his fields, it looks like a font or stoup. A great site to visit with lots of intrigue. Situated: From Bellanagare on the N5 South. Take the first left. It runs parallel with the main road. Drive to the first sharp bend. Park here and walk up the track. The stones are on your right. The landowner is very friendly. Discovery Map 33: M 7565 8727. Last visit Sept 2011. Possible font at the gateway.